MOFFETT FIELD, Calif. (NASA PR) — NASA’s Ames Research Center, Moffett Field, Calif., has won the 2011 NASA Government Invention of the Year. Ames received the award for developing Toughened Uni-piece Fibrous Reinforced Oxidation-Resistant Composite (TUFROC), a low-cost, lightweight, two-piece, thermal protection system (TPS) for use on space vehicles during atmospheric re-entry at hypersonic speed. 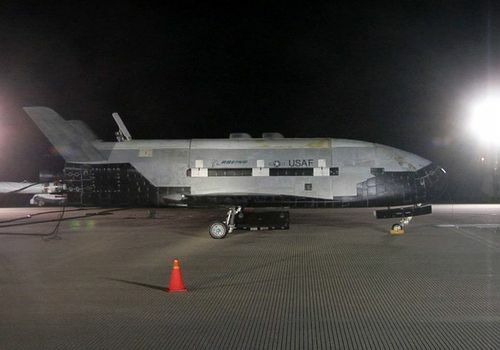 TUFROC, a patented technology invented by David A. Stewart and Daniel B. Leiser of Ames, has been successfully demonstrated on the X-37B Reusable Launch Vehicle. The technology consists of a high temperature, impregnated carbonaceous cap mechanically attached to a lightweight fibrous silica-base material. The key innovations enable the integration of the surface treated carbon cap with the silica base insulation, which otherwise would fail from mechanical, chemical or thermal factors. TUFROC is the first lightweight, low cost, flight proven, reusable TPS with sustained operational capabilities at temperatures above 3,000 degrees Fahrenheit. Stewart and Leiser will be honored at the NASA Project Management Challenge Conference early next year. Each NASA field center submits nominations for the awards, which are evaluated by NASA’s Inventions and Contributions Board. The board determines which nominations qualify for each category, ranks the nominees, and makes recommendations to the NASA Office of the General Counsel for review and approval. Ames previously won the NASA Government Invention of the Year award in 2007 for the invention of PICA and SIRCA Low-Density Resin Impregnated Ceramics. Ames also received the award in 2008 for the invention of a high-speed 3-D laser scanner with real time processing, and in 2010 for inventing aircraft traffic management methodologies which are implemented in the Future ATM (Air Traffic Management) Concepts Evaluation Tool, or FACET software that creates simulations for managing air traffic scenarios. Ames also won NASA Commercial Invention of the Year in 2010 for the Powder Handling Device for Analytical Instruments. Is Paul Allen Buying Pratt & Whitney Rocketdyne?